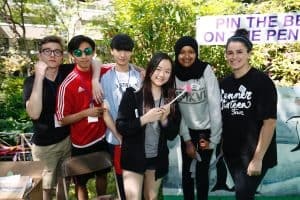 Volunteers are essential to the Vancouver International Children’s Festival. Our Festival can only run smoothly with the generous help of a 1,000 devoted volunteers. Each year, volunteers, like you, contribute to the success of the Festival by helping us welcome 25,000 attendees! It is a huge endeavour and we could not do it without you! As a matter of fact, we LOVE our volunteers and as a token of our appreciation, we offer many perks to thank you for your contribution. Free snacks and candies at the Volunteer Centre, a place where you can rest, refuel, hang out during your break and expand your circle of friends. Activity Village Wristband: You will receive one Free wristband to the Activity Village for each day you volunteer. This means you can bring your sibling or come back to the Festival at a later time. Signed Confirmation outlining that you volunteered “x” hours for the Festival. This is not a reference letter. It is a note confirming your participation in the Festival. School credit for hours volunteered. If you require Work Experience forms and Work Experience Evaluation forms completed, you need to volunteer a minimum of 21 hours. All volunteers who complete 30 hours or more will are invited to the Volunteer Party! Join us after the Festival to let loose and have some fun. There will be food, beverages, cake, candies and the opportunity to win prizes and to share your highlights of the Festival with other volunteers. You will also get a peak into the impact you had on the thousands of kids who came to the Festival with their class. Willing to give your time with a smile. Contribute to the best of your abilities. Flexible, patient, respectful with a good dose of humility. We have a lot of positions to choose from, so we have categorized them in three groups depending on the time commitment and skills required. On average, a shift is seven hours long. Please take a few minutes to read the different positions available by clicking on the links above before you decide to proceed and join our team! Interested? Please fill out our Volunteer Registration Form so we can find you the best possible position based on your skills and interests. Thank you and we look forward to having you on our team! 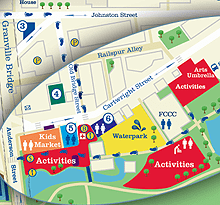 If you have any questions, please contact us at volunteer@childrensfestival.ca or call us at 604-708-5655.